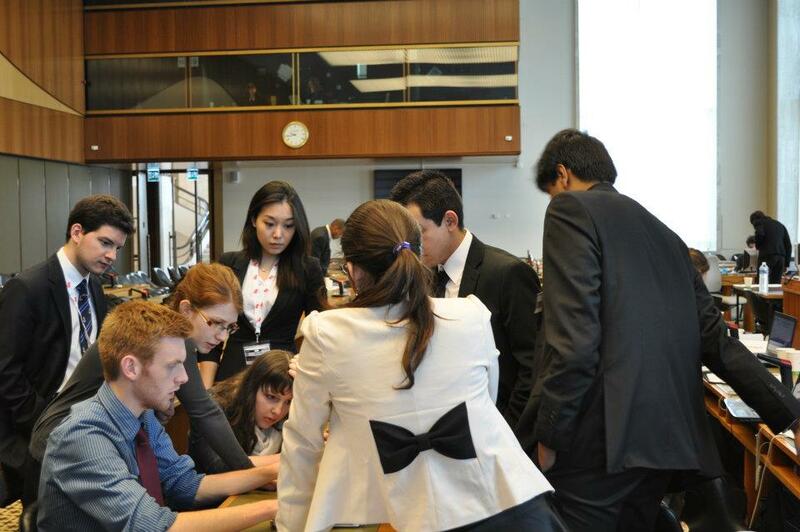 Cassandra Stimpson '13 (second from left) caucuses with fellow delegates in the GIMUN Economic and Social Committee. Photo: Francis Mayne for GIMUN, used with permission. Pace University New York City students Cassandra Stimpson ’13 (pictured above) and Elena Marmo ’15 were recognized with “Special Mention” awards for their participation in a simulation of the UN General Assembly’s Economic and Social Council (ECOSOC) this week at the Geneva International Model United Nations (GIMUN) conference in Switzerland. They were among 11 Pace NYC students selected to attend the prestigious conference held in the auspicious Palais des Nations – former League of Nations headquarters and current location of the UN Office at Geneva. From Freehold, New Jersey, last fall Cassandra was part of Pace NYC’s delegation representing Colombia in a simulation of the Commission on the Status of Women (CSW) at the National Model UN conference in Washington DC (NMUN DC). She was recognized as an “Outstanding Delegate”, and received a “Distinguished Delegation” group award. Cassandra is a resident adviser in the Pace University dorms and is currently working for GOAL, a humanitarian NGO. Elena Marmo '15 (center, seated) and Cassandra Stimpson '13 (third from left) prepare a draft resolution in the Economic and Social Council of the 2012 Geneva International Model UN conference. “If I want to be a global citizen, I feel that I need to experience the globe by interacting with its people, especially on topics that concern us all,” said Elena, an Honors College freshman political science major and peace and justice studies minor, who represented Rwanda in ECOSOC. “I do not think that we can be passive citizens in a world where global citizenship is necessary to make contributions to humanity.” From Lake Hiawatha, New Jersey, this is Elena’s second time to participate in an ECOSOC simulation; she represented the United Kingdom at NMUN DC, winning a “Distinguished Delegation” group award. She is liaison to the New York City area of the Amnesty International chapter at Pace NYC. The 2012 GIMUN conference theme was “Achieving Dialogue and Development through Cultural Diversity.” Participants hailed from 49 countries, and committee sessions were simultaneously translated between French and English. Located only two express subway stops from the iconic United Nations complex on the East River, Pace University’s New York City Model UN program has a 60-year history of excellence in regional, national and international conferences. 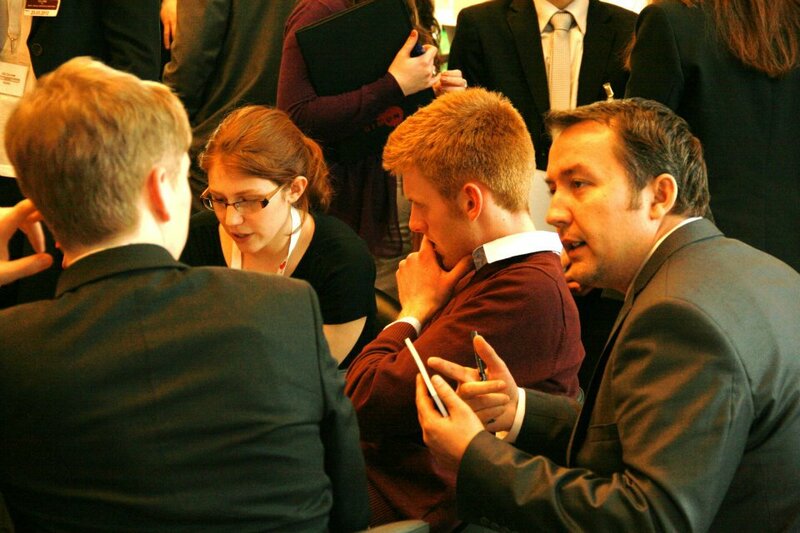 Model UN at Pace is uniquely integrated into the Political Science curriculum within the Dyson College of Arts and Sciences. This entry was posted in News and tagged Cassandra Stimpson, DC, Distinguished Delegation, Dyson College, Dyson College of Arts and Sciences, Economic and Social Committee, ECOSOC, Elena Marmo, Geneva, Geneva International Model United Nations, GIMUN, Model United Nations, MUN, National Model United Nations, New York City, NMUN, Pace, Pace University, Peace and Justice Studies, Pfozheimer Honors College, Political Science, Rwanda, UN General Assembly, UN Office in Geneva, United Nations, UNOG, Venezuela, Washington DC. Bookmark the permalink.